The barbiturate phenobarbital induces the transcription of cytochromes P450 (CYPs) 2B through the constitutive androstane receptor (CAR; NR1I3). CAR is a member of the nuclear receptor family (NR1) mostly expressed in the liver, which heterodimerizes with retinoid X receptor (RXR) and was shown to transactivate both the phenobarbital responsive element module of the human CYP2B6 gene and the CYP3A4 xenobiotic response element. Because previous studies in rodent hepatocyte cultures have shown that the phenobarbital-mediated induction of CYP2B genes is potentiated by glucocorticoids, we examined the role of activated glucocorticoid receptor in this process. 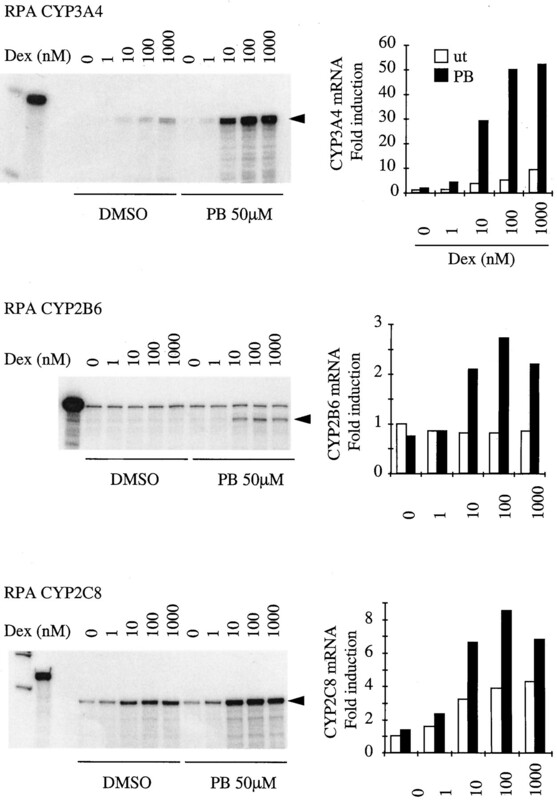 We show that submicromolar concentrations of dexamethasone enhance phenobarbital-mediated induction of CYP3A4, CYP2B6, and CYP2C8 mRNA in cultured human hepatocytes. In parallel, we observed that glucocorticoid agonists, such as dexamethasone, prednisolone, or hydrocortisone, specifically increase human car (hCAR) mRNA expression. Accumulation of hCAR mRNA parallels that of tyrosine aminotransferase: both mRNAs reach a maximum at a concentration of 100 nM dexamethasone and are down-regulated by concomitant treatment with the glucocorticoid antagonist RU486. Moreover, the effect of dexamethasone on hCAR mRNA accumulation appears to be of transcriptional origin because the addition of protein synthesis inhibitor cycloheximide has no effect, and dexamethasone does not affect the degradation of hCAR mRNA. Furthermore, dexamethasone increases both basal and phenobarbital-mediated nuclear translocation of CAR immunoreactive protein in human hepatocytes. The up-regulation of CAR mRNA and protein in response to dexamethasone explains the synergistic effect of this glucocorticoid on phenobarbital-mediated induction of CYP2B genes and the controversial role of the glucocorticoid receptor on phenobarbital-mediated CYP gene inductions. Induction of drug- and carcinogen-metabolizing cytochrome P450s (CYP) by xenobiotic chemicals is a common cellular defense mechanism, usually leading to increased detoxification of xenobiotics but sometimes, paradoxically, to formation of more toxic and carcinogenic metabolites (Conney, 1982). The expression of the genes encoding these enzymes is known to be regulated by a number of factors, including physiological, pathological, genetic, and environmental factors. Xenobiotics themselves play an important role as CYP inducers (Savas et al., 1999;Waxman, 1999). Phenobarbital is a prototypic representative for chemicals, including industrial solvents, pesticides, plant products, and clinically used drugs that induce several genes within CYP subfamilies 2B, 2A, 2C, and 3A in rodents and humans (Waxman and Azaroff, 1992). Recently, two “orphan” nuclear receptors designated pregnane X receptor (PXR; NR1I2) and constitutive androstane receptor or constitutively activated receptor (CAR; NR1I3) have been implicated in the phenobarbital-mediated induction of hepatic CYP3A and CYP2B genes, respectively (Honkakoski et al., 1998; Kliewer et al., 1998;Lehmann et al., 1998). PXR, also termed steroid and xenobiotics receptor and pregnane-activated receptor, has been proposed to mediate the induction of expression of CYP3A genes by a number of different steroids, steroid antagonists, and xenobiotics such as rifampicin, clotrimazole, and phenobarbital. This is based on both the activation of PXR by such compounds and the identification of PXR response elements in CYP3A promoters (Bertilsson et al., 1998; Blumberg et al., 1998; Kliewer et al., 1998; Lehmann et al., 1998; Goodwin et al., 1999; Pascussi et al., 1999). CAR is most abundantly expressed in the liver and has a strong constitutive activity in cell-based reporter assays in the absence of any added ligand (Baes et al., 1994; Choi et al., 1997). In HepG2 cells or other cell lines, transfected CAR enters the nucleus and regulates the expression of target genes. This constitutive activity can be inhibited by superphysiological concentrations of the testosterone metabolites androstanol and androstenol (Forman et al., 1998). These androstanes inhibit the interaction of CAR with the steroid receptor coactivator 1 (SRC-1), suggesting that “deactivation” is mediated by direct binding to the orphan receptor. In contrast to transfected cell lines, CAR is not present in the nucleus of primary hepatocytes but instead is sequestered in the cytoplasm. Treatment of primary mouse hepatocytes with either phenobarbital or the planar hydrocarbon TCPOBOP results in the translocation of mCAR into the nucleus, where it binds to its cognate DNA response elements as a heterodimer with RXR and eventually activates the transcription of target genes, including CYP2B (Honkakoski and Negishi, 1998b; Honkakoski et al., 1998; Kawamoto et al., 1999; Sueyoshi et al., 1999). CAR/RXR binding sites have been identified in the phenobarbital-responsive regions of the mouse, rat, and human CYP2B genes (Honkakoski and Negishi, 1998b; Honkakoski et al., 1998; Kawamoto et al., 1999; Sueyoshi et al., 1999) and in the distal xenobiotic response element of CYP3A4 (Moore et al., 2000). The effects of phenobarbital on CYP2B expression are blocked by the phosphatase inhibitor okadaic acid (Honkakoski and Negishi, 1998a;Kawamoto et al., 1999), suggesting that dephosphorylation of CAR, rather than direct ligand binding, is involved in its translocation into the nucleus. CAR and PXR belong to the same nuclear receptor gene family (family NR1), share a common heterodimerization partner, retinoid X receptor (RXR), and may be subject to cross-talk interactions with other nuclear receptors and with a broad range of other intracellular signaling pathways, including those activated by certain hormones. Notably, it has long been known that dexamethasone, or glucocorticoids, are required for both efficient phenobarbital responsiveness of CYP2B10 in mice and CYP2B2 in rats (Shaw et al., 1993) and CYP3A23 induction in response to PXR activators in cultured rat hepatocytes (Burger et al., 1992; Quattrochi et al., 1995). Indeed, we recently reported the importance of culturing primary human hepatocytes with submicromolar concentrations of dexamethasone to efficiently maintain both hPXR and hRXRα expression and in vivo-like responsiveness of hPXR activators on CYP3A4 induction in vitro (Pascussi et al., 2000). In this work, we investigated the role of glucocorticoids and glucocorticoid receptor on both the phenobarbital-mediated CYP induction and on the expression of hCAR in primary cultures of human hepatocytes. We report that CYP2B6, CYP2C8, and CYP3A4 mRNA inductions in response to phenobarbital are markedly enhanced by submicromolar concentrations of dexamethasone and that this effect is accompanied by an increased expression of human CAR gene at both the mRNA and nuclear protein levels. Ham's F-12 and William's E culture media, vitamins and hormones, collagenase (type IV), dimethyl sulfoxide (DMSO), actinomycin D, cycloheximide, and dexamethasone were purchased from Sigma (St. Quentin Fallavier, France). Phenobarbital was purchased from Specia (Paris, France). Collagen-coated culture dishes were obtained from Corning (Iwaki, Japan). α-[32P]dCTP, α-[32P]UTP, and enhanced chemiluminescence (ECL) developing reagent were purchased from Amersham-Pharmacia (Buckinghamshire, England). Hepatocytes were prepared from lobectomy segments resected from adult patients for medically required purposes unrelated to our research program (Table 1). The use of these human hepatic specimens for scientific purposes has been approved by the French National Ethics Committee. Hepatocytes were prepared and cultured according to the previously published procedure (Pichard et al., 1995). The cells were plated into 100-mm plastic dishes precoated with collagen at 10 × 106 cells per plate in a total volume of 6 ml of a hormonally and chemically defined medium consisting of a mixture of Williams' E and Ham's F-12 (1:1 in volume). Forty-eight hours after plating, dexamethasone was withdrawn from the culture medium for 16 h. Cells were then cultured in the presence or absence of the indicated inducers for 6 to 48 h. Total RNA and protein were isolated, using Trizol reagent (Life Technologies, Cergy-Pontoise, France), from 107 cultured hepatocytes according to the manufacturer's instructions. For quality control, 30 μg of total RNA were analyzed by Northern blot using a rat glyceraldehyde phosphate dehydrogenase cDNA probe (J. M. Blanchard, Institut de Genetique Moleculaire de Montpellier, Montpellier, France). Plasmids for CYP3A4 (Pichard et al., 1995), hPXR and hGR (Pascussi et al., 2000) RNase protection assays were previously described. A 263-bp fragment of the CYP2B6 (nucleotides 25–288) was amplified by PCR with oligonucleotides sense 5′-AGCCTCCCACCAGGGCCCCGCCC and reverse 5′TGGCAAAGATCACACCATATCCCC, digested by PstI and SalI, and cloned inPstI/SalI-digested pBluescript II-KS+ vector (Stratagene, La Jolla, CA). The ribonuclease protection assay probe was synthesized with T3 RNA polymerase after linearization of plasmid withSmaI. The native CYP2B6 probe contains 192 bp, and the digested probe is 180 bp long. A 311-bp fragment (nucleotides 982-1293) was amplified by PCR with oligonucleotides sense 5′-GATCATGTAATTGGCAGACACA and reverse 5′-CCTGCTGAGAAAGGCATGAAG and cloned in pGEMT vector (Promega, Charbonnières, France). The ribonuclease protection assay probe was synthesized with SP6 RNA polymerase after linearization of plasmid with ApaI. The native probe contains 365 bp, and the digested probe is 239 bp long. After PCR amplification, cDNA encoding amino acids +1/341 hCAR from CDM8-hCAR (Baes et al., 1994), using oligonucleotides 5′-CGGAATTCATGGCCAGTAGGGAAG (sense) and 5′-AAAAAAGCGGCCGCCTCAGCTGCAGATCTCCTGG (antisense), were digested byEcoRI and NcoI and inserted inEcoRI/NcoI sites of pcDNA3.0 (Invitrogen BV, Groningen, The Netherlands). After deletion of the ApaI fragment and religation of the truncated pcDNA-hCAR, the pcDNA3-ΔApaIhCAR containing only the NT-DBD region (+1/355 nucleotides) of hCAR was linearized using BamHI, and the antisense 5′hCAR probe was synthesized using SP6 polymerase. The native probe was 372 nucleotides long, and the protected band was 355 nucleotides long. The 0.284-kb PstI fragment of pcDNA3-hCAR, corresponding to the hCAR (+754/1038 nucleotides) LBD-CT, was cloned in the PstI site of pGEMT. To prepare the 3′hCAR RNase protection probe, the pGEMT-3′hCAR plasmid was digested withXhoI, and the antisense probe was synthesized using T7 polymerase. The native probe was 314 nucleotides, and the protected probe was 284 nucleotides. Total RNA (30 μg) was analyzed by the RNase protection assay using specific probes as previously described (Greuet et al., 1997). Total RNA was hybridized with radiolabeled antisense RNA probe (100,000–150,000 cpm) overnight at 37°C after incubation for 10 min at 95°C. For Northern blot experiments, 30 μg of total RNA were analyzed using α-[32P]dCTP-labeled mouse tyrosine aminotransferase (TAT) (T. Grange, Institut J. Monod, Paris, France) cDNA probe, autoradiography was carried out by exposing the dried gel to X-AR film (Kodak, Rochester, NY), and the signals were quantified by analyzing the radioactivity with PhosphorImager and ImageQuant software (both from Molecular Dynamics, Sunnyvale, CA). Nuclear extracts were prepared as previously reported (Pascussi et al., 2000). Hepatocytes (107) were washed, harvested in ice-cold PBS and pelleted by centrifugation at 1500g for 5 min. The pellet was resuspended in 400 μl of cold buffer A (10 mM HEPES, pH 7.9, 10 mM KCl, 0.1 mM EDTA, 0.1 mM EGTA, 1 mM dithiothreitol, 0.5 mM phenylmethylsulfonyl fluoride), and cells were allowed to swell on ice for 15 min, after which 25 μl of 10% Nonidet P-40 were added and the tube was vortexed for 30 s. After centrifugation, the nuclear pellet was resuspended in 75 μl of ice-cold buffer C (20 mM HEPES, pH 7.9, 0.2 M NaCl, 1 mM EDTA, 1 mM EGTA, 1 mM dithiothreitol, 0.5 mM phenylmethylsulfonyl fluoride), and the tube was vigorously rocked at 4°C for 30 min. Finally, the nuclear extract was centrifuged for 5 min, and the supernatant was frozen at −80°C. Thirty micrograms of nuclear extracts from 107 hepatocytes were separated by SDS-polyacrylamide gel electrophoresis (10%) and then electroblotted onto Imobilon P (Millipore, Bedford, MA). Membranes were incubated with specific antibodies against hCAR (M. Negishi, National Institute on Environmental Health Sciences, Triangle Park, NC), RXRα (TEBU, Le Perray en Yvelines, France), or p130 retinoblastoma protein (TEBU) and developed with the enhanced chemiluminescence detection system (Amersham-Pharmacia). Effect of Dexamethasone on Phenobarbital-Mediated CYP2B6, CYP2C8, and CYP3A4 mRNA Induction in Cultured Human Hepatocytes. Induction of CYP mRNA by phenobarbital has been shown to be enhanced by nanomolar concentrations of dexamethasone in primary cultures of animal hepatocytes (Waxman and Azaroff, 1992; Sidhu and Omiecinski, 1995b;Honkakoski and Negishi, 1998a). The ability of CYP genes to respond to low concentrations of glucocorticoids in synergy with phenobarbital indicates the possibility for a glucocorticoid receptor-dependent mechanism. Therefore, we have decided to study the effect of dexamethasone on phenobarbital-mediated CYP induction in primary cultures of human hepatocytes. Hepatocytes cultured in a dexamethasone-free medium for 16 h were exposed for 48 h to 50 μM phenobarbital either in the absence or presence of increasing concentrations of dexamethasone (1 nM to 1 μM). Then, the levels of CYP2B6, CYP2C8, and CYP3A4 mRNA were measured by RNase protection assays. As shown in Fig. 1, phenobarbital alone only slightly induced CYP3A4 and CYP2C8 mRNAs (1.6-fold induction), while it failed to induce CYP2B6 mRNA accumulation. Dexamethasone alone at submicromolar concentrations produced a dose-dependent increase in both CYP2C8 and CYP3A4 mRNA accumulation but did not affect CYP2B6 mRNA expression. However, concomitant addition of dexamethasone and phenobarbital produced a strong increase in the expression of CYP2B6, CYP2C8, and CYP3A4 mRNAs in a concentration-dependent manner. This enhancement reached a maximum at 100 nM dexamethasone, a concentration that fully activates the glucocorticoid receptor without activating the hPXR (Bertilsson et al., 1998; Lehmann et al., 1998). However, and notably for CYP2B6, we exclude a strict effect of cis-cooperation between the glucocorticoid receptor and the phenobarbital signaling pathway because this cytochrome appeared to be dexamethasone insensitive. We postulate that dexamethasone can up-regulate the expression of factor(s) necessary for the phenobarbital response. In this respect, we recently reported that dexamethasone (ligand)-activated glucocorticoid receptor increases both hPXR and hRXRα mRNA expression and enhances PXR activator-mediated induction of CYP3A4 in human hepatocytes (Pascussi et al., 2000). Because phenobarbital activates PXR in transient transfection assays (Lehmann et al., 1998; Moore et al., 2000), the potentiation observed between dexamethasone and phenobarbital on CYP3A4 mRNA accumulation could be explained by the increase of the PXR:RXRα heterodimer level in the nucleus upon dexamethasone treatment. However, no data are available on the role of PXR on CYP2C8 gene regulation, and CYP2B6 is believed to be regulated by another nuclear receptor activated by phenobarbital, i.e., CAR (Sueyoshi et al., 1999). We then focused our attention on the effect of dexamethasone on hCAR expression. Submicromolar concentrations of dexamethasone (Dex) augment phenobarbital-dependent increases in mRNA of CYP3A4, CYP2B6, and CYP2C8 in primary cultures of human hepatocytes. Human hepatocytes cultured in a dexamethasone-free medium for 16 h were exposed for 48 h to 50 μM phenobarbital or vehicle (0.1% DMSO) either alone or in association with increasing concentrations of dexamethasone (1 nM to 1 μM). Total RNAs were extracted, and 15 μg were subjected to RNase protection assays with antisense CYP3A4, CYP2B6, or CYP2C8 mRNAs probes, as described under Experimental Procedures. ut, control cells; PB, phenobarbitol-treated cells. Radioactivity associated with the protected band was measured with PhosphorImager and ImageQuant software, and the values are expressed in fold induction compared with control cells. White bars refer to the absence, and black bars refer to the presence of phenobarbital. These RNase protection assays were obtained from culture FT167, and similar results were obtained on FT155 and FT160. Effect of Glucocorticoids on CAR mRNA Expression in Primary Culture of Human Hepatocytes. We investigated the effect of glucocorticoids on CAR mRNA expression. For this purpose, we first designed a ribonuclease probe directed against the 3′LBD (ligand-binding domain) of CAR, because this region represents the most divergent domain between nuclear receptors. Using this probe in an RNase protection assay on total RNAs from liver tissues (Fig.2A), we observed two protected bands, one corresponding to the expected size (LBD-FL) and a smaller unidentified band (LBD-Tr, truncated domain). 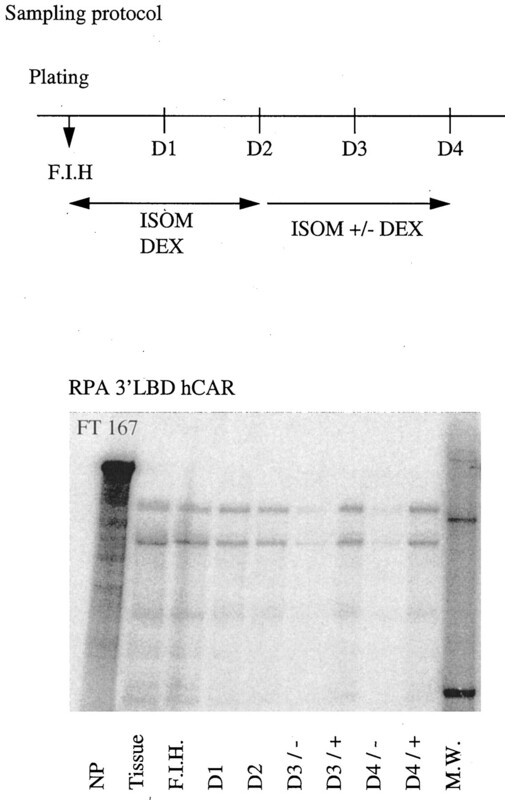 This smaller band was not present in human hepatoma cell line (HuH7) stably transfected with hCAR, suggesting that this protected band may represent the human homolog of the LBD spliced mouse CAR mRNA species, mCAR2 (Choi et al., 1997) (Fig.2A, bottom). Effectively, using the same RNAs and a probe directed against the 5′DBD (DNA-binding domain) of CAR, only one protected band was observed (Fig. 2B). Note that, because the native probe contains a portion of the multiple cloning site of the pcDNA3.0, the protected band observed in HuH7 stably transfected with the pcDNA3.0-hCAR appeared longer than the one observed in hepatocytes (Fig. 2B, bottom). Identification of CAR mRNAs by RNase protection. A, total RNAs (30 μg) from A549 cells, HuH7 stably transfected with control pcDNA or hCAR-pcDNA expression vector, and a liver tissue were analyzed by ribonuclease protection assays with antisense 3′LBD hCAR mRNA probe (corresponding to the CAR ligand-binding domain). M.W., size marker, PM2 DNA digested by HindIII; NP, native probe; DP, ribonuclease-digested unprotected probe. LBD-FL and LBD-Tr, corresponding, respectively, to normal and spliced hCAR RNA isoforms, are indicated on the right and described in the inset. B, total RNAs (30 μg) from A549 cells, HuH7 stably transfected with control pcDNA or hCAR-pcDNA3.0 expression vector, and a liver tissue were analyzed by ribonuclease protection assays with antisense 5′DBD hCAR mRNA probe (corresponding to the DNA-binding domain). M.W., size marker, PM2 DNA digested by HindIII; NP, native probe; DP, ribonuclease-digested unprotected probe. DBD and DBD + MCS, corresponding, respectively, to endogenous hCAR mRNA and exogenous hCAR RNA plus 30 bp of the pcDNA3.0 multiple cloning sites, are indicated on the right and described in the inset. Forty-eight hours after plating, human hepatocytes were cultured in a dexamethasone-free medium for 16 h and then were cultured for 48 h in the absence or presence of 100 nM dexamethasone. Total RNA was prepared and analyzed by RNase protection assays with both 5′DBD and 3′LBD probes. As shown in Fig. 3, CAR mRNAs were induced by dexamethasone. Because mCAR-1 and mCAR-2 have different properties in terms of reporter transactivation and binding to DNA (Choi et al., 1997), we used the probe directed against the LBD to investigate the regulation of both messengers. After 48 h of treatment, we observed an accumulation of CAR mRNAs with all the glucocorticoid receptor agonists tested, i.e., dexamethasone, prednisolone, and hydrocortisone. 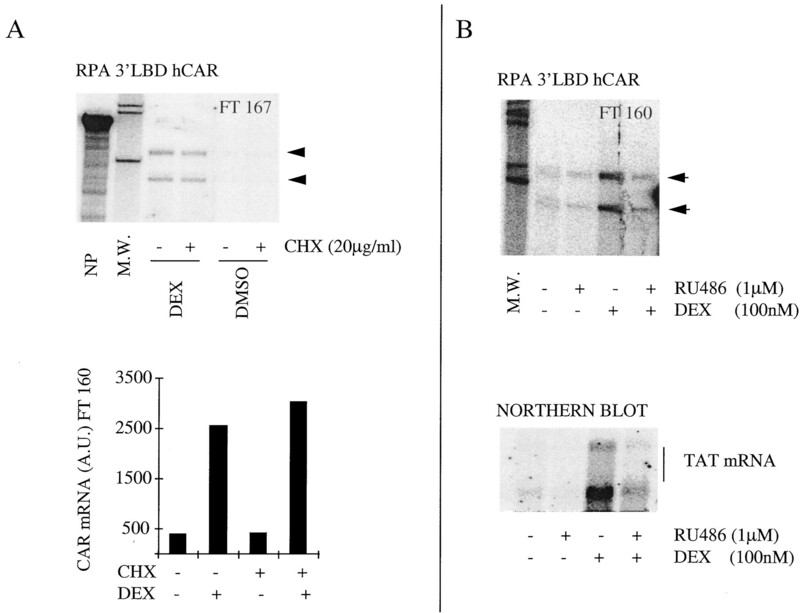 In contrast, neither rifampicin, clotrimazole, RU486, pregnenolone 16α-carbonitrile, nor phenobarbital affected CAR mRNA expression at micromolar concentrations, irrespective of the presence of 100 nM dexamethasone (Fig. 3 and data not shown). CAR mRNAs were induced by 3.8- to 8-fold in response to 100 nM dexamethasone, depending on the culture (mean = 6.3,P < .05, n = 6). Glucocorticoids increase the expression of CAR mRNA in primary human hepatocytes. A, forty-eight hours after plating the hepatocytes (FT166), dexamethasone was withdrawn from the medium for 16 h. Cells were then cultured in the presence of 100 nM dexamethasone for 48 h. Total RNA was extracted, and 30 μg were analyzed by RNase protection with antisense 5′DBD hCAR mRNA or 3′LBD hCAR mRNA probes. M.W., size marker, PM2 DNA digested byHindIII; NP, native probe. Specific protected bands are indicated by arrowheads. B, forty-eight hours after plating the hepatocytes, dexamethasone was withdrawn from the medium for 16 h. Cells were then cultured in the presence of 100 nM dexamethasone for 48 h. Total RNA was extracted, and 30 μg were analyzed by RNase protection with antisense 3′LBD hCAR mRNA probe. Radioactivity associated with hCAR mRNA protected bands was measured with PhosphorImager and ImageQuant software, and the values are expressed in fold induction compared with control cells. Results shown represent mean and S.D. from six different cultures (FT159, FT160, FT163, FT166, FT167, and FT168, P < .03). C, cells from FT 160 were then cultured for 48 h in the presence of 1 μM prednisolone (Pred), 1 μM hydrocortisone (H.C.), 5 μM rifampicin (RIF), 5 μM RU486 (RU), 50 μM phenobarbital (PB), 10 to 100 nM dexamethasone (DEX), or vehicle alone (NT). Total RNA was extracted, and 30 μg were analyzed by RNase protection with antisense 3′LBD hCAR mRNA probe. M.W., size marker, PM2 DNA digested by HindIII. Specific protected bands are indicated by arrowheads. To document the origin of CAR mRNA induction by dexamethasone, we evaluated the effect of actinomycin D on this process. For this purpose, hepatocytes were cultured for 24 h in the presence of 100 nM dexamethasone. Then, the cells were treated with actinomycin D in the absence or presence of dexamethasone. At 4, 8, 16, and 32 h after initiation of actinomycin D treatment, expression of CAR mRNAs was quantified by RNase protection. The results reported in Fig.4 show that CAR mRNA expression decreased significantly in actinomycin D-treated cells with a half-life of approximately 8 h for the full-length species, irrespective of the presence of dexamethasone. This suggests that dexamethasone did not affect the rate of degradation of CAR mRNAs and that the increase in CAR mRNAs in response to glucocorticoids is of transcriptional origin. Note that the two mRNA species appeared to display different stability, the spliced species appearing more stable than the full-length species. Effect of dexamethasone (DEX) on the stability of CAR mRNA. 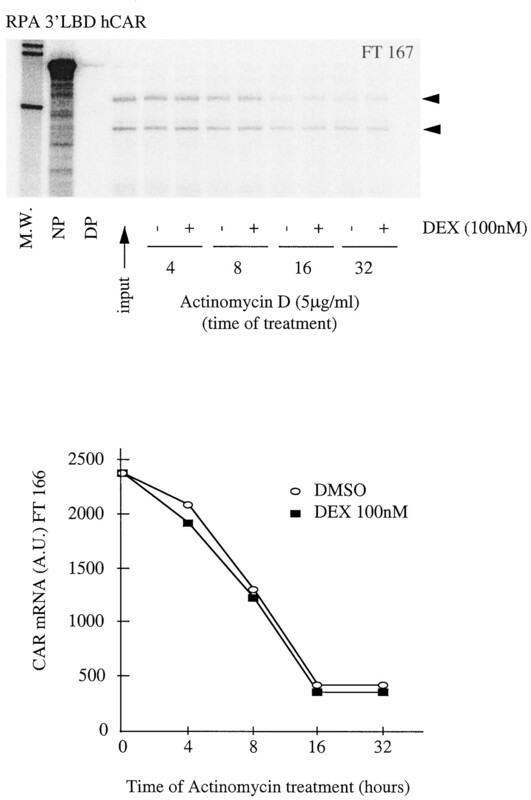 Actinomycin D was added to hepatocyte cultures pretreated with 100 nM dexamethasone for 24 h at the final concentration of 5 μg/ml. The cultures were then continued for a further 4 to 32 h in the presence (+) or absence (−) of 100 nM dexamethasone. Cells were harvested, and total RNAs were prepared. RNAs (30 μg) were analyzed by ribonuclease protection assays with antisense 3′LBD hCAR mRNA probe. Radioactivity associated with the specific CAR protected band was measured with PhosphorImager and ImageQuant software, and the values are expressed in arbitrary units (A.U.). M.W., size marker, PM2 DNA digested by HindIII; NP, native probe; DP, ribonuclease-digested unprotected probe. These RNase protection assays were obtained from cultures FT166 and FT167, and similar results were obtained on FT159. Glucocorticoid Receptor Controls CAR Gene Transcriptional Activation in Human Hepatocytes. Glucocorticoids are able to induce both primary and secondary responses in target tissues. A primary response is characterized by a direct association of the hormone-receptor complex with a specific DNA sequence in the target gene, resulting in modification of transcription. The effect is independent of protein synthesis, as previously reported in particular for the TAT gene (Cole et al., 1995). Conversely, a secondary response requires protein synthesis for transcription of the induced RNA and a time lag between administration of the hormone and initiation of the response (Nebes and Morris, 1987; Fan et al., 1992). The nature of the response of the hCAR gene to dexamethasone in cultured human hepatocytes was further investigated by analyzing: i) the concentration and time dependence of CAR mRNA induction in comparison to the TAT gene, ii) the effect of cycloheximide, an inhibitor of protein synthesis, and iii) the effect of a glucocorticoid antagonist, RU486. As shown in Fig. 5A, dexamethasone induced CAR mRNA accumulation in a concentration-dependent manner from 1 nM to 1 μM after 48 h of treatment, the maximum being reached at 100 nM. Similar results were observed with TAT mRNA. In addition (Fig. 5B), the increase of CAR mRNA levels by 100 nM dexamethasone could be detected as early as 6 to 8 h after beginning the treatment, depending on cultures, the maximum being reached after 24 to 48 h. Similar results were observed with TAT mRNA. Thus, both CAR and TAT mRNAs exhibited parallel induction in response to dexamethasone in terms of concentration and time dependence. Concentration dependence and time course of CAR mRNA response to dexamethasone (DEX). Cells from patient FT168 were cultured in the presence of dexamethasone at the indicated concentrations ranging from 1 nM to 1 μM for different periods. Total RNA was extracted, and 30 μg were analyzed by RNase protection with antisense 3′LBD hCAR mRNA probe or by Northern blot analysis using TAT32P-labeled cDNA probes. M.W., size marker PM2 digested byHindIII; NP, native probe; DP, digested probe. Specific protected bands are indicated by an arrow. These data were obtained from culture FT168 and similar results were obtained on FT160 and FT166. As shown in Fig. 6A, pretreatment of cells with cycloheximide did not affect the increase of hCAR mRNAs accumulation in response to dexamethasone, suggesting that protein synthesis is not required in this process. In agreement with the rapid decay of CAR mRNA observed after dexamethasone withdrawal, these data strongly suggest that CAR expression is not related to a differentiation phenotype of our hepatocytes, maintaining by glucocorticoid-induced transcription factor. In addition, the glucocorticoid antagonist RU486 significantly inhibited both hCAR and TAT mRNA accumulation in a similar way (Fig. 6B). These observations are consistent with a direct transcriptional regulation of CAR expression by the activated glucocorticoid receptor without intermediate gene product. Dexamethasone-activated glucocorticoid receptor increases the expression of CAR mRNA by enhancing its transcription. A, forty-eight hours after plating the hepatocytes, dexamethasone was withdrawn from the medium for 16 h. Cells were then pretreated (+) or not (−) with 20 μM cycloheximide for 2 h and then cultured in the absence or presence of 100 nM dexamethasone (DEX). Twenty-four hours later, total RNA was extracted, and 30 μg were analyzed by RNase protection with antisense 3′LBD CAR mRNA probe. Radioactivity associated with the specific hCAR mRNA protected bands were measured with PhosphorImager and ImageQuant software, and the values are expressed in arbitrary units (A.U.). These RNase protection assays were obtained from cultures FT167 and FT160, and similar results were obtained on FT168. B, forty-eight hours after plating of hepatocytes, dexamethasone was withdrawn from the medium for 16 h. Cells were then pretreated or not with 1 μM RU486 for 2 h and then cultured in the presence (+) or absence (−) of 100 nM dexamethasone. Twenty-four hours later, total RNA was extracted, and 30 μg were analyzed by RNase protection with antisense 3′LBD hCAR mRNA probe or Northern blot with an mTAT cDNA probe. These RNase protection assays were obtained from culture FT160, and similar results were obtained on FT168. M.W., size marker PM2 digested by HindIII; NP, native probe. Specific protected bands are indicated by arrows. Dexamethasone Increases Both Basal Level and Phenobarbital-Mediated Nuclear Translocation of CAR Protein in Human Hepatocytes. Next, we examined the effects of dexamethasone on CAR protein steady-state levels in nuclear extracts from cultured human hepatocytes. For this purpose, human hepatocytes cultured in a dexamethasone-free medium for 16 h were exposed for 48 h to 100 nM dexamethasone or vehicle alone. Cells were then treated or not with 100 μM phenobarbital for 8 or 16 h and nuclear extracts were prepared. The immunoblot analysis presented in Fig. 7A shows that hCAR protein was present in hepatocyte nuclear extracts as a 38-kDa band, identical to that observed in nuclear extracts from hCAR-transfected COS cells but migrating slightly ahead of the mouse protein expressed in COS cells. The hCAR protein level was increased in the nuclear extracts of cultured hepatocytes exposed to 100 nM dexamethasone. Interestingly, phenobarbital treatment produced a marked and time-dependent accumulation of hCAR protein only in the nucleus of dexamethasone-pretreated hepatocytes. Because phenobarbital failed to induce hCAR mRNA induction, even in presence of dexamethasone (Fig.7B), this accumulation may represent the effects of dexamethasone and phenobarbital on hCAR subcellular localization, i.e., nuclear translocation. 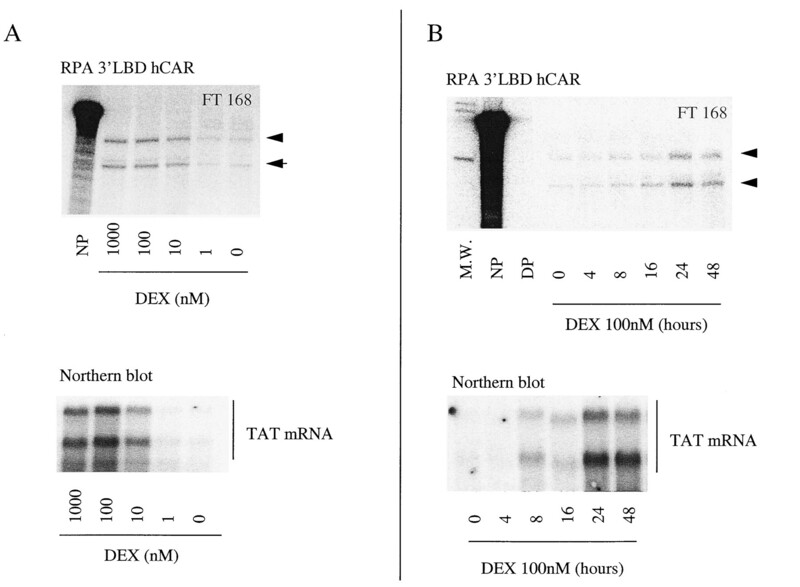 We previously reported that RXRα protein was significantly expressed in nuclear extracts from cultured hepatocytes and induced by dexamethasone (Pascussi et al., 2000). In contrast, the level of p130, a member of the pocket protein family (retinoblastoma), was not affected by dexamethasone and/or phenobarbital treatments. Thus, these results show that phenobarbital-mediated nuclear translocation of the CAR protein is significant only in hepatocytes exposed to submicromolar concentrations of glucocorticoids. The finding that the nuclear translocation of CAR in dexamethasone-treated cells is not accompanied by an increased expression of CYP2B6 (see Fig. 1) indicates that nuclear translocation of CAR per se is not sufficient for CYP2B6 induction, suggesting that a further step of activation of this receptor in the nucleus is necessary for full activity (M. Negishi, personal communication). Dexamethasone augments both basal and phenobarbital-mediated nuclear translocation of CAR protein levels in human hepatocytes. Forty-eight hours after plating the hepatocytes, dexamethasone was withdrawn from the medium for 16 h. Cells were then cultured for 48 h with (+) or without (−) 100 nM dexamethasone (DEX) before phenobarbital (PB) (100 μM) or DMSO (0.1%) treatment for 8 or 16 h. Cells were harvested for the extraction of nuclear extracts or total RNA as described underExperimental Procedures. 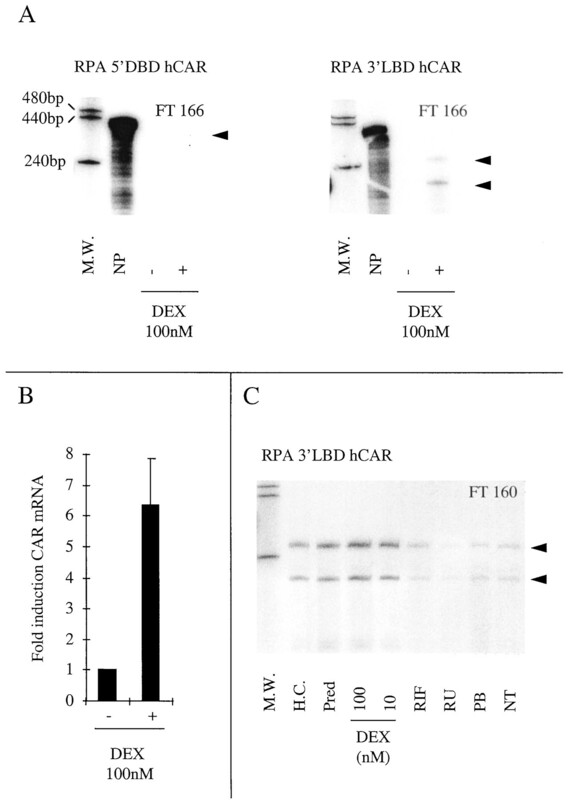 A, 30-μg aliquots of the nuclear extract were subjected to Western blot analysis using specific antibodies against p130 Rb (1:300 dilution), RXRα (1:1000 dilution), or hCAR (1:5000 dilution). Size markers (in kilodaltons) are indicated at left. P130 Rb, RXRα, and hCAR proteins are indicated by arrowheads. Nuclear extracts (20 μg) from transiently transfected COS cells with mCAR, hCAR, or expression vector alone were used as migration standards. Protein staining control using Amidoblack is shown in the bottom panel. 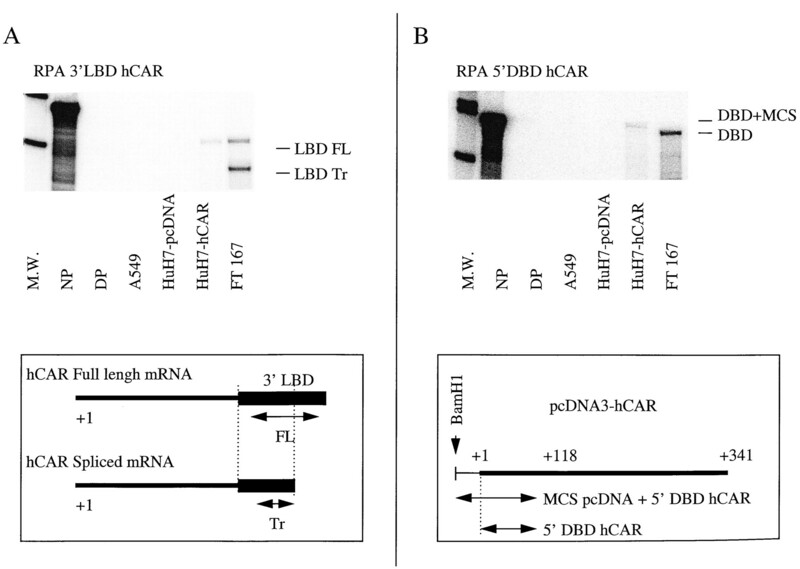 B, 30 μg of total RNA were analyzed by RNase protection with antisense 3′LBD hCAR mRNA probe. M.W., size marker PM2 digested by HindIII; NP, native probe; DP, digested probe. Specific hCAR protected bands are indicated by arrowheads. Expression of CAR mRNA in Human Liver Tissue Compared with Cultured Hepatocytes. To evaluate the relevance of the present observations to the in vivo situation, we compared the levels of CAR mRNA in our cultures with those measured in the corresponding tissue and in freshly isolated hepatocytes. For this purpose, hepatocytes were plated and cultured in the presence of 100 nM dexamethasone for 2 days. The culture was then continued, either in the absence or presence of dexamethasone for 2 more days (between days 3 and 4 after plating). Total RNA was extracted from the liver tissue (before collagenase perfusion), from freshly isolated hepatocytes (before plating), and from cultured hepatocytes (at days 1, 2, 3 and 4 after plating) and analyzed by RNase protection. The results are reported in Fig.8 for patient and culture FT167. CAR mRNAs were expressed significantly in the tissue, and their levels exhibited no major change when measured in freshly isolated hepatocytes. In the standard culture conditions (i.e., in the presence of 100 nM dexamethasone), CAR mRNA exhibited a transient decrease at days 1 and 2 after plating but returned to a level close to that observed in the tissue at day 3, and this level was maintained up to day 4. The transient decrease observed at days 1 and 2 is believed to result from the stress due to cell isolation and plating, because this is routinely observed with other phenotype markers such as α1-antitrypsin production, for example (J. B. Ferrini, personal communication), RXRα, or PXR (Pascussi et al., 2000). As expected, when cells were cultured in the absence of dexamethasone (between days 2 and 4), the levels of CAR mRNA exhibited a dramatic decrease. CAR mRNA receptor levels in human liver compared with cultured hepatocytes. Hepatocytes from patient FT 168 were plated and cultured under standard conditions (Williams' E/ham's F12 media (1:1) plus 100 nM dexamethasone) for 2 days. Cells were then cultured either in the absence (−) or presence (+) of 100 nM dexamethasone until day 4. Total RNA was extracted from the liver tissue, freshly isolated hepatocytes (F.I.H. ), or cultured hepatocytes at the time indicated. Thirty micrograms of RNA were analyzed by RNase protection with antisense 3′LBD hCAR mRNA probe. M.W., size marker PM2 digested byHindIII; NP, native probe. We have previously reported that the classical glucocorticoid pathway is involved in rifampicin-mediated CYP3A4 inducibility through the regulation of the expression of two nuclear receptors (PXR and RXRα) (Pascussi et al., 2000). In the present work we have investigated the mechanism by which dexamethasone potentiates the phenobarbital-mediated induction of CYP2B6, CYP2C8, and CYP3A4 mRNAs in primary culture of human hepatocytes. Our results show that this potentiation is accompanied by a concomitant increase of hCAR mRNA levels and of nuclear translocation of the protein. Although run-on experiments have not been performed in this study, the data suggest that this control occurs at the transcriptional level because i) dexamethasone does not affect the degradation of CAR mRNA, ii) this induction is partially blocked by the glucocorticoid antagonist RU-486, and iii) cycloheximide does not affect the accumulation of CAR mRNA in dexamethasone-treated hepatocytes. Because the expression of CAR mRNA in response to dexamethasone parallels that of TAT mRNA, in terms of time course and concentration dependence, it is suggested that dexamethasone (ligand)-activated glucocorticoid receptor positively regulates hCAR gene expression. Our finding that dexamethasone positively controls CAR mRNA and protein translocation into the nucleus clearly accounts for the synergistic effect of this glucocorticoid on the phenobarbital-mediated induction of CYP2B genes. Several authors have reported the inhibition of phenobarbital-mediated transcriptional activation of the rat CYP2B by the antiglucocorticoid RU486 in cultured hepatocytes (Wright et al., 1996; Pereira et al., 1998). In addition, others have previously reported that submicromolar concentrations of dexamethasone enhanced CYP gene induction in response to phenobarbital, in cultured mice or rat hepatocytes (Waxman and Azaroff, 1992; Sidhu and Omiecinski, 1995b; Honkakoski and Negishi, 1998a). Taken together, these data indicate that the potentiation observed between submicromolar concentrations of dexamethasone and phenobarbital is not restricted to human hepatocytes. Effectively in contrast to species specificity for dexamethasone-mediated PXR activation (Kliewer et al., 1998; Lehmann et al., 1998), GR activation is well conserved among these species. Moreover, PXR is not involved in this process because i) the dexamethasone-mediated CAR expression is observable with nanomolar concentrations [which are not expected to activate either human or rodent PXR (Kliewer et al., 1998;Lehmann et al., 1998)], ii) these effects are inhibited by the antiglucocorticoid RU486 [which is also a potent PXR activator (Lehmann et al., 1998)], and iii) CAR expression is not affected by micromolar concentration of rifampicin (Fig. 3). In addition, using knock-out mice, Schuetz et al. (2000) reported that the glucocorticoid receptor is essential for dexamethasone CYP2B expression. Because the presence of glucocorticoid responsive elements (GREs) in the regulatory region of CYP2B genes, the possible implication of GR acting as a direct transactivation factor in this process has been addressed by some authors. For instance, it has been reported that mouse and rat CYP2B genes contain several GREs, some of which can be functionally activated by glucocorticoids (Jaiswal et al., 1990). Moreover, the mouse cyp2b10 and the rat CYP2B1/2 genes exhibit a xenochemical response element module (Park et al., 1996; Liu et al., 1998; Stoltz et al., 1998), which contains nuclear hormone response elements, including DR4 and a potential GRE (Stoltz et al., 1998). Mutation experiments on this GRE in rat CYP2B2 suggested that a protein binding to/or close to this region might be required for phenobarbital induction. However, it has been reported that CYP2B1/2 genes are not induced by treatment with submicromolar concentrations of dexamethasone alone, either in vitro or in vivo (Sidhu and Omiecinski, 1995a,b). In addition, the presence of a functional GRE has not been reported in human CYP2B6, and in fact, we observed that, in human hepatocyte cultures, dexamethasone alone is not an inducer of this gene. Therefore, a direct action of GR on CYP gene transactivation does not explain the synergistic effect of dexamethasone and phenobarbital on the CYP2B6 gene expression. Alternatively, the potentiation by dexamethasone of phenobarbital-mediated induction of CYP2B genes has been suspected to result from a modification of the hepatocyte phenotype in response to the glucocorticoid, leading to increased CYP gene expression. Effectively, dexamethasone and related glucocorticoids are known to exert effects on the maintenance of hepatocytes in a differentiated phenotype (Williams et al., 1978). The results reported here strongly support this alternative hypothesis, and our data provide additional arguments in favor of a critical role of glucocorticoids in the maintenance of a differentiated phenotype in cultured hepatocytes. As other transcription factors involved in both the specific expression [as C/EBP (MacDougald et al., 1995)] or xenobiotic-mediated induction [as PPAR (Lemberger et al., 1994), PXR, and RXR (Yamaguchi et al., 1999; Pascussi et al., 2000)] of differentiated hepatic enzymes (as cytochromes), CAR seems to be directly controlled by the glucocorticoid receptor. We have shown here that three gene subfamilies, including CYP2B6, CYP2C8–9, and CYP3A4, are coinduced by phenobarbital in primary human hepatocytes. Although CAR and PXR have been primarily implicated as regulators of CYP2B and CYP3A gene expression, it is currently unknown whether CYP2C8 gene expression is controlled by one or both of these receptors. Nevertheless, the finding that CYP2C8 strongly responds to phenobarbital and rifampicin in our cultures suggests that this could be the case. Interestingly, there is significant experimental evidence for a cross-talk between these two nuclear signaling pathways. First, the CYP2B and CYP3A genes are coinduced in rodent and human hepatocytes by several xenobiotics, including phenobarbital, rifampicin, and clotrimazole (Kocarek et al., 1993; Strom et al., 1996). Second, CAR is able to transactivate CYP3A4 xenobiotic response element (ER6), which serves as a PXR/RXR binding site (Sueyoshi et al., 1999; Moore et al., 2000). Third, it has been reported recently that both PXR and CAR transactivate a CYP3A4 reporter construct containing a distal xenobiotic response element (−7836 to −7208) fused to the proximal promoter of CYP3A4 (−362 to +53). Finally, CAR and PXR share xenobiotic and steroid ligands in vitro (Moore et al., 2000). In addition, we have shown recently that dexamethasone up-regulates the PXR/RXR heterodimer (Pascussi et al., 2000). Therefore, whether the potentiation by dexamethasone observed on CYP2B6, CYP2C8/9, and CYP3A4 phenobarbital-mediated induction in human primary hepatocytes results from the up-regulation of CAR, PXR, or both is currently unknown. However, CAR may represent the major phenobarbital transductional pathway, because S. Kliewer (13th International Symposium on Microsomes and Drug Oxidations, July, 2000, Strese, Italy) recently reported that phenobarbital was still a CYP3A inducer, in contrast to dexamethasone or PCN, in PXR null mice. Finally, our finding that GR might control the expression of nuclear receptor transcription factors, i.e., PXR, RXR, and CAR, involved in the regulation of CYP gene expression perhaps reveals the existence of a regulatory network that governs endocrine hormone homeostasis. Indeed, PXR and CAR regulate CYPs, which are involved in the oxidative metabolism of natural steroid hormones, including glucocorticoids. We are grateful to Dr. S. Kliewer (GlaxoWellcome, Research Triangle Park, NC) and Dr. M. Negishi (National Institute on Environmental Health Sciences, Research Triangle Park, NC) for providing expression vectors for h- and mPXR, and hCAR and CAR polyclonal antibody, respectively. Send reprint requests to: Dr. Marie-Jose Vilarem, INSERM U128-IFR24, Centre National de la Recherche Scientifique, 1919 Route de Mende, 34293 Montpellier Cedex 05, France. ↵1 These two authors have equally contributed to this work. This work was supported by grants from the Institut National de la Santé et de la Recherche Médicale, the Ligue Nationale contre le Cancer (J.M.P. ), and Laboratoires Fournier (S.G.-C.). (1998) Identification of a human nuclear receptor defines a new signaling pathway for CYP3A induction. Mol Pharmacol 54:1113–1117. (1992) Paradoxical transcriptional activation of rat liver cytochrome P-450 3A1 by dexamethasone and the antiglucocorticoid pregnenolone 16 alpha-carbonitrile: analysis by transient transfection into primary monolayer cultures of adult rat hepatocytes. Proc Natl Acad Sci USA 89:2145–2149. (1997) Differential transactivation by two isoforms of the orphan nuclear hormone receptor CAR. J Biol Chem 272:23565–23571. (1995) Molecular genetic analysis of glucocorticoid signaling during mouse development. Steroids 60:93–96. (1982) Induction of microsomal enzymes by foreign chemicals and carcinogenesis by polycyclic aromatic hydrocarbons: G. H. A. Clowes memorial lecture. Cancer Res 42:4875–4917. (1992) Cloning of a mu-class glutathione S-transferase gene and identification of the glucocorticoid regulatory domains in its 5′ flanking sequence. Proc Natl Acad Sci USA 89:6104–6108. (1998) Androstane metabolites bind to and deactivate the nuclear receptor CAR-beta. Nature (Lond) 395:612–615. (1997) Effect of cell density and epidermal growth factor on the inducible expression of CYP3A and CYP1A genes in human hepatocytes in primary culture. Hepatology 25:1166–1175. (1998a) Protein serine/threonine phosphatase inhibitors suppress phenobarbital-induced Cyp2b10 gene transcription in mouse primary hepatocytes. Biochem J 330:889–895. (1998b) Regulatory DNA elements of phenobarbital-responsive cytochrome P450 CYP2B genes. J Biochem Mol Toxicol 12:3–9. (1990) Glucocorticoid regulation of a phenobarbital-inducible cytochrome P-450 gene: The presence of a functional glucocorticoid response element in the 5′-flanking region of the CYP2B2 gene. Nucleic Acids Res 18:4237–4242. 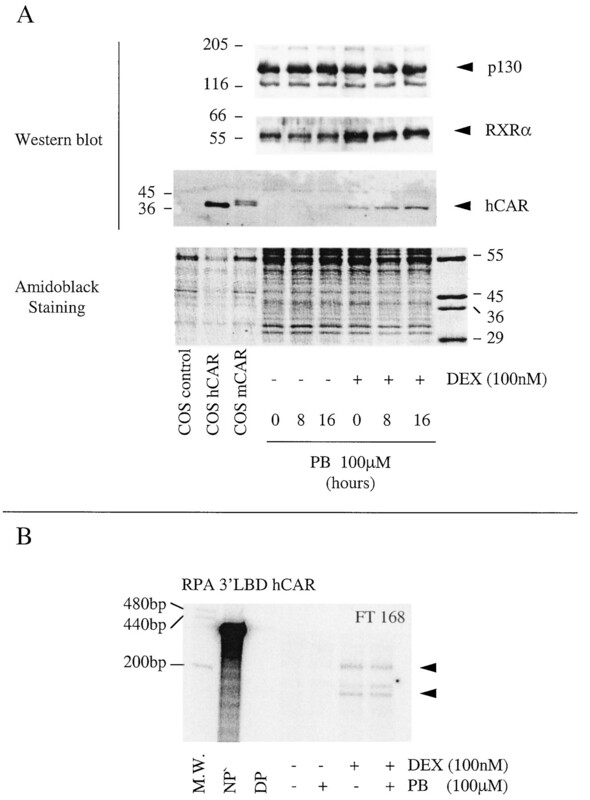 (1999) Phenobarbital-responsive nuclear translocation of the receptor CAR in induction of the CYP2B gene. Mol Cell Biol 19:6318–6322. (1998) An orphan nuclear receptor activated by pregnanes defines a novel steroid signaling pathway. J Clin Invest 102:1016–1023. (1993) Expression of multiple forms of cytochrome P450 mRNAs in primary cultures of rat hepatocytes maintained on matrigel. Mol Pharmacol 43:328–334. (1998) The human orphan nuclear receptor PXR is activated by compounds that regulate CYP3A4 gene expression and cause drug interactions. Proc Natl Acad Sci USA 95:12208–12213. (1994) Regulation of the peroxisome proliferator-activated receptor alpha gene by glucocorticoids. J Biol Chem 269:24527–24530. (1998) Nuclear factor-1 motif and redundant regulatory elements comprise phenobarbital-responsive enhancer in CYP2B1/2. DNA Cell Biol 17:461–470. (1995) Glucocorticoids reciprocally regulate expression of the CCAAT/enhancer- binding protein alpha and delta genes in 3T3–L1 adipocytes and white adipose tissue. Annu Rev Biochem 64:345–373. (1987) Induction of mRNA for phosphoenolpyruvate carboxykinase (GTP) by dexamethasone in cultured rat hepatocytes requires on-going protein synthesis. Biochem J 246:237–240. (1996) Phenobarbital induction mediated by a distal CYP2B2 sequence in rat liver transiently transfected in situ. J Biol Chem 271:23725–23728. (2000) Dexamethasone induces pregnane X receptor and retinoid X receptor-alpha expression in human hepatocytes: Synergistic increase of CYP3A4 induction by pregnane X receptor activators. Mol Pharmacol 58:361–372. (1999) Evidence for the presence of a functional pregnane X receptor response element in the CYP3A7 promoter gene. Biochem Biophys Res Commun 260:377–381. (1998) Identification of a functional glucocorticoid response element in the CYP3A1/IGC2 gene. Cell 92:73–82. (1995) Effect of corticosteroids on the expression of cytochromes P450 and on cyclosporin A oxidase activity in primary cultures of human hepatocytes. Mol Pharmacol 47:410–418. (1995) A novel cis-acting element in a liver cytochrome P450 3A gene confers synergistic induction by glucocorticoids plus antiglucocorticoids. J Biol Chem 270:28917–28923. (1999) Molecular mechanisms of cytochrome P-450 induction by xenobiotics: An expanded role for nuclear hormone receptors. Mol Pharmacol 56:851–857. (2000) The glucocorticoid receptor is essential for induction of cytochrome P-4502B by steroids but not for drug or steroid induction of CYP3A or P-450 reductase in mouse liver. Drug Metab Dispos 28:268–278. (1993) The phenobarbital-induced transcriptional activation of cytochrome P-450 genes is blocked by the glucocorticoid-progesterone antagonist RU486. Mol Pharmacol 44:775–783. (1995a) cAMP-associated inhibition of phenobarbital-inducible cytochrome P450 gene expression in primary rat hepatocyte cultures. J Biol Chem 270:12762–12773. (1995b) Modulation of xenobiotic-inducible cytochrome P450 gene expression by dexamethasone in primary rat hepatocytes. Pharmacogenetics 5:24–36. (1998) The CYP2B2 phenobarbital response unit contains an accessory factor element and a putative glucocorticoid response element essential for conferring maximal phenobarbital responsiveness. J Biol Chem 273:8528–8536. (1992) Phenobarbital induction of cytochrome P-450 gene expression. Biochem J 281:577–592. (1978) Rat hepatocyte primary cultures. IV. Maintenance in defined medium and the role of production of plasminogen activator and other proteases. Vitro 14: 824–837. (1996) Glucocorticoid receptor-independent transcriptional induction of cytochrome P450 3A1 by metyrapone and its potentiation by glucocorticoid. Mol Pharmacol 50:856–863. (1999) Glucocorticoids increase retinoid-X receptor alpha (RXRalpha) expression and enhance thyroid hormone action in primary cultured rat hepatocytes. J Mol Endocrinol 22:81–90.